On the last day of July Steve McQueen’s Heuer Monaco (or rather one of them) sold for US$799,500 at an auction in Hollywood. Though it looks to be in superb condition, this is a ridiculous price for a watch that is not historically significant, not in the sense of the Patek Philippe ref. 2499 or Rolex Submariner. And for someone of my generation Steve McQueen has little cachet so the celebrity connection has zero value for me. Usually when a watch sells for an outrageous price I suspect the hidden hand of the watch brand attempting to increase its own brand equity, but in this case the price is so silly I doubt TAG Heuer forked out $800,000 for this watch. 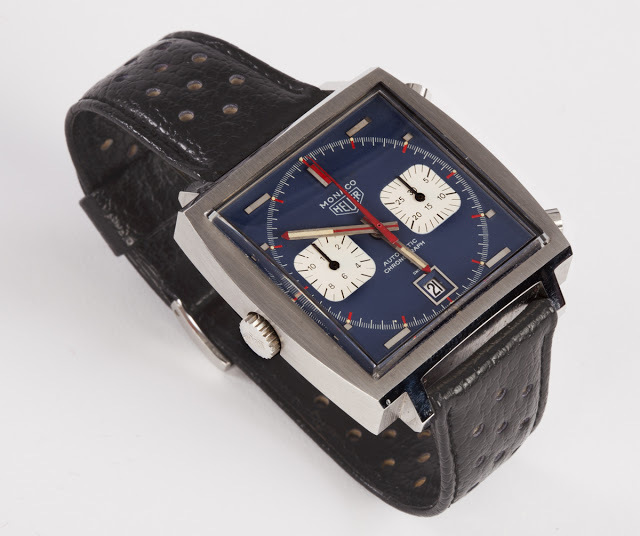 You can find out more about this watch (and a whole lot of other Heuer timepieces) at Heuer collector site OntheDash.